What happens when the ambient air temperature drops by an interval of 18°F (10°C)? You smart guys know that the pot life and cure time of epoxies doubles for temperature drops of this interval. This means that if the data sheet says the gel time is 25 minutes at 73°F, you will have to wait about 100 minutes at 37°F (2 intervals of 18°F drop) to observe the first thickening. Of course, the reverse is that for every interval of 18°F rise in ambient temperature, the gel times (and cure times) of epoxies are halved. Finally, keep in mind that most ambient cure epoxies start to go into hibernation between 35-40°F. Since not all of you are blessed to work in a warm climate year-round, what can you do to get epoxy to perform when it’s cold? The first step when cold weather strikes is a little advance planning. The night before the project, bring your epoxy containers into your office where the heat stays on. When transporting, leave the containers in the cab (if this can be done safely) rather than in the unheated pickup bed. Another option is to deliver the epoxy the day before to the job site and bring a portable electric heater to warm a small room or closet. For larger jobs, one of our customers tows a work trailer with baseboard heaters and a generator to keep his epoxy a toasty 85°F and he leaves it at the site. The other benefit of extra warm components is that mixing Parts A and B is easier and faster when the viscosity is decreased by warm storage conditions. Finally, you can tent almost any substrate (see image above) and add supplemental heat in larger areas using propane, diesel or electric heat sources. Infrared heat lamps are useful to keep small quantities warm and a 40 or 60-watt standard light bulb can be hung inside your injection pump to keep the reservoirs warm (keep the bulb away from internal wiring and hoses). If your glue is in 5-gallon pails, you can get an external heater which clamps around the bucket regulated to 160°F maximum from Grainger or McMaster Carr (specify the heater band model for poly containers and don’t forget to vent the bucket). For cold weather crack injection using taped ports, it may be difficult to precisely locate the crack under the injection nozzle and this problem is magnified when the resin viscosity is higher due to the cold. An alternative is to install our small ribber tips on the cracks located with toothpicks and then spread the surface seal. Pull the toothpick to inject into the sealed-in tip. The seal can also be cured a bit faster using a hot air gun at its low setting (if you see smoke, it’s too hot). Frozen water in concrete cracks is a known frustration. Also, you will have longer waiting times for the surface seal cure and for injection resin cure so don’t inject too soon and don’t strip the seal too soon. For coatings, remember to look for less than 85% humidity and air temperature 4°F or more above the dew-point. Dew point consideration is many times more important in cold weather due to the high probability that it is close to the actual air temperature. Invisible dew trapped under impermeable epoxy is a problem especially if the substrate is not permeable. Generally, you need not worry if the temperature drops overnight after the epoxy has been placed (hopefully under significantly warmer conditions). Why? Because the epoxy will probably go dormant below 35-40°F, but will begin to cure again once the temperature rises. Electric hot air guns and/or electric blankets designed for concrete can be used to provide temporary warmth to a cold substrate. Take care to avoid heating the surface or any standard epoxy to over 200°F. 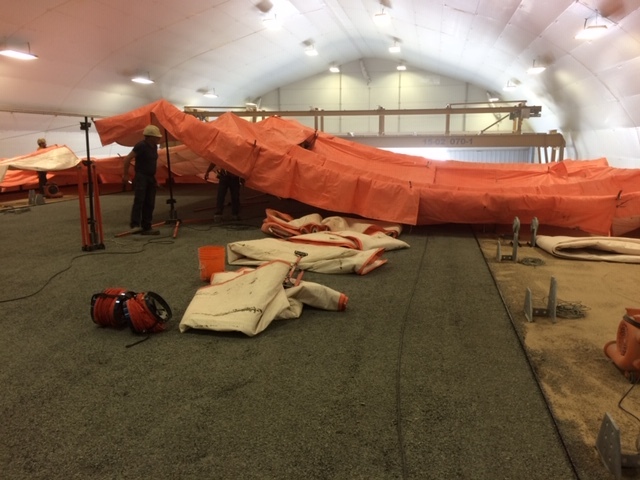 If you are performing work with a concrete or steel substrate subject to large temperature swings due to very cold nights and warm and/or direct sun exposures, be sure to carefully plan the use of rigid (load-bearing) epoxies in consideration of substrate expansion/contraction movements. For epoxy injection, that means placing the seal during the hottest period of the substrate rather than the coldest to avoid the cracking of the seal. If you are performing coating work with epoxies (especially floor coatings), avoid the combination of poor circulation of air and the use of torpedo (gas or diesel fired) heaters in enclosed spaces. This combination can be lethal due to the build up of carbon monoxide but can also lead to uncured coatings that exhibit severe blushing due to the absorption of excessive carbon dioxide.